Breakfast was pretty much my Venti Iced Decaf Latte with a Caramel Drizzle (3 pts). I wasn’t hungry so I decided to delay breakfast until I was hungry. 6 points and worth every single one! Since I was out and about, I decided I NEEDED to give into my craving ~ salty, crunchy, veggie LOVE! It started off with a little Panda Express string bean chicken which is only 3 points! Then, I get the steamed mixed veggies instead of the rice or chow mein for 1 point. No afternoon snack was needed since I didn’t get the chance to eat lunch until almost 2 pm :/ After work, I headed to my Weight Watcher meeting. I forgot to tell you all I lost a lb last week, but, I made sure to find it this week. It was completely earned ~ I started off on such a great note on Friday, but, by Saturday afternoon I caved. This week WILL be a better week! 2 spicy chicken tacos for 8 points. 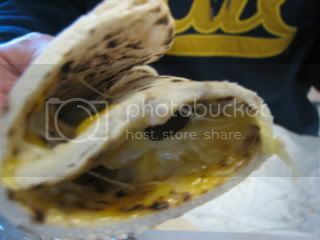 I also couldn’t resist a few bites of his cheesy quesadilla ~ they make their own tortillas there and I honestly could eat just that LOL. MMMM ~ cheese plus doughy bread goodness! I did a little shopping at Sam’s Club, the mall and Trader Joe’s before heading home to do laundry and work in my Bake Sale Goodies! Decadent Dark Chocolate Fruit & Nut Clusters in mini and large (2 pts)! I cannot wait for tomorrow ~ dollar days are back at my FAVORITE GYM EVER!!! It’s a way over priced gym in Napa (sorry, but, they all are)….but, during the summer they charge only $1 a day ~ wahooo! I am ALL OVER that and cannot wait ~ renewed motivation for sure! P.S. Yes, I am recycling some pictures until I figure out how to use my old camera…at least I am being greener that way LOL….I kid! BE SURE TO ENTER MY BIGGEST LOSER GIVEAWAY!!! I am off to catch some zzzzzzz’s! « A Biggest Loser GIVEAWAY!!! My mouth is watering looking at those treats. I have a feeling my husband will be stalking our mailbox! 🙂 Thanks again for donating your yummy treats to Bobbi’s fundraiser! Eat what you crave is my life right now! I’m in the first trimester of pregnancy and have all the food aversions. Everything you had today looked good though. Especially that Panda Express. I know I always say that, but today it’s a whole new level! And how nice there are actually veggies involved. Veggies are normally the last thing I can picture eating until the food aversions pass in another month or so. dollar days! that is so cool. what a steal. sorry about the camera, again. ha, at first i thought those were droid photos and then you said they were recycled. i was astonished at first! but those treats do look yummy. of course you had to test them out! Please check out my new blog if you get the chance. Thanks!